Phew! 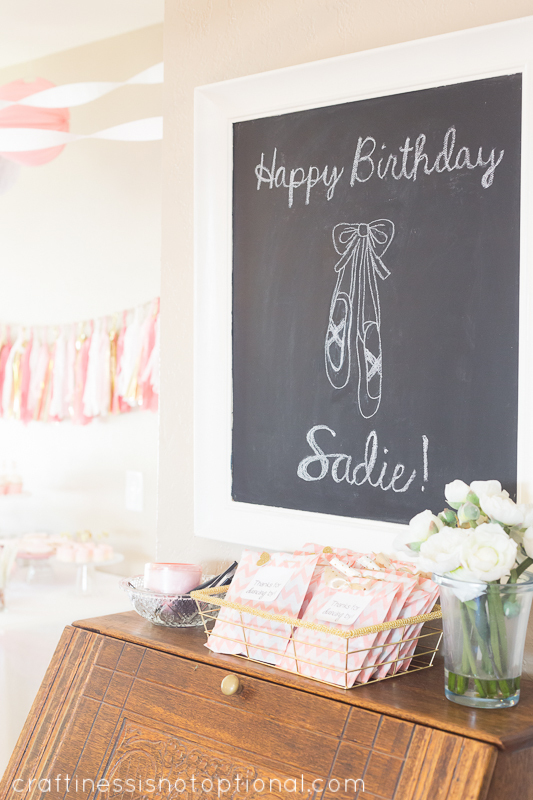 I made it through a bridal shower, helping with my sister’s wedding (which I still need to blog about), and now a ballet birthday bash-all in a week and a half! I’m exhausted to say the least. But my birthday girl had a blast and that’s what matters! We had a girls only party-as requested by the birthday girl. We’re moving into the drop-off-friend-party phase, and I gotta say, I like it! Much smaller scale, which is nice. I also bought some things ahead of time, but most of this party was thrown together in the last week. yikes. I don’t like doing that, but it worked out fine! Just a little stressful. First off, the amazing invite designed by my awesome pal Tara over at Paper Patch Ink! I took a picture of Sadie in her ballet recital outfit and she turned that into this amazing silhouette which was showcased on the invitation! I love everything about it! She has tons more fabulous designs in her shop and does custom designs as well. Can’t say enough good things about her! 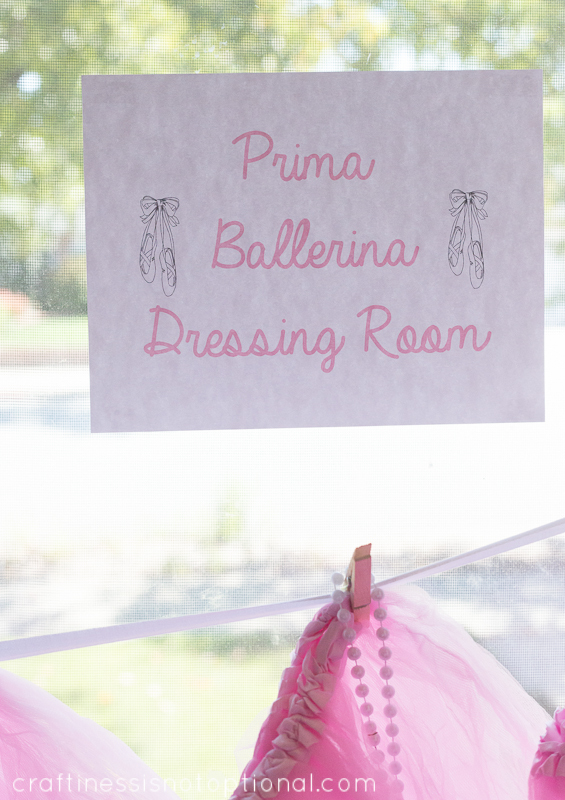 I had a little corner set up with everything a ballerina needs! I made a quick last minute sign for the corner! 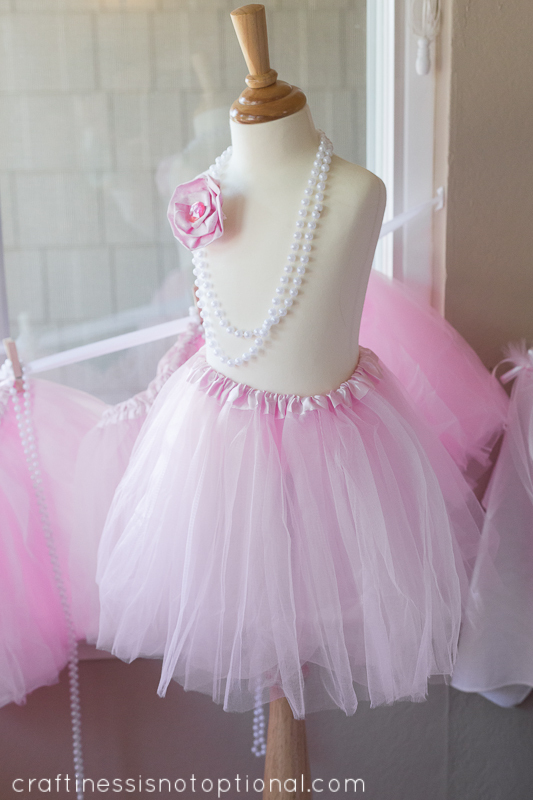 I strung some twill tape up and clipped tutus and pearl necklaces (affiliate link) on for each girl. The tutus I got from my sponsor, The Ribbon Retreat! They are great quality and it fits most kids 2 and up, which was true! 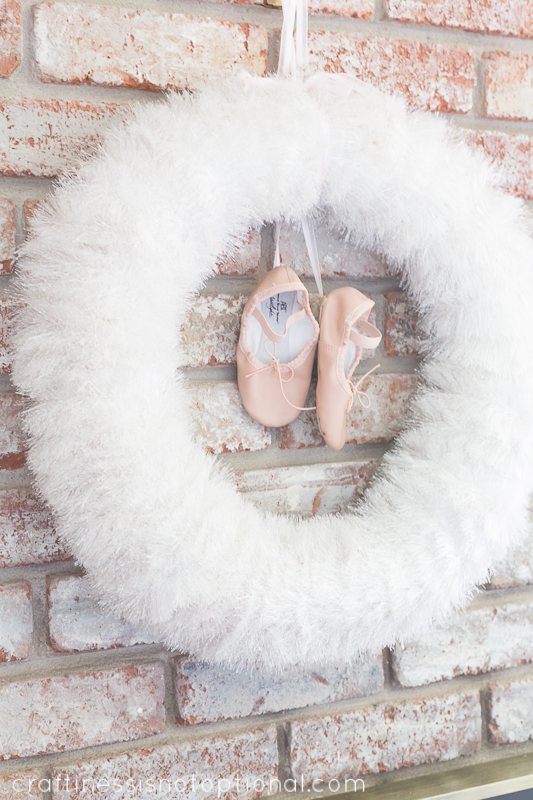 The girls loved wearing them and dressing up like ballerinas! I set up an over the door mirror for the girls to preen in front of, and my sister Julia did their make up! They all loved it! She also taught them some simple ballet steps and they had a great time dancing around! 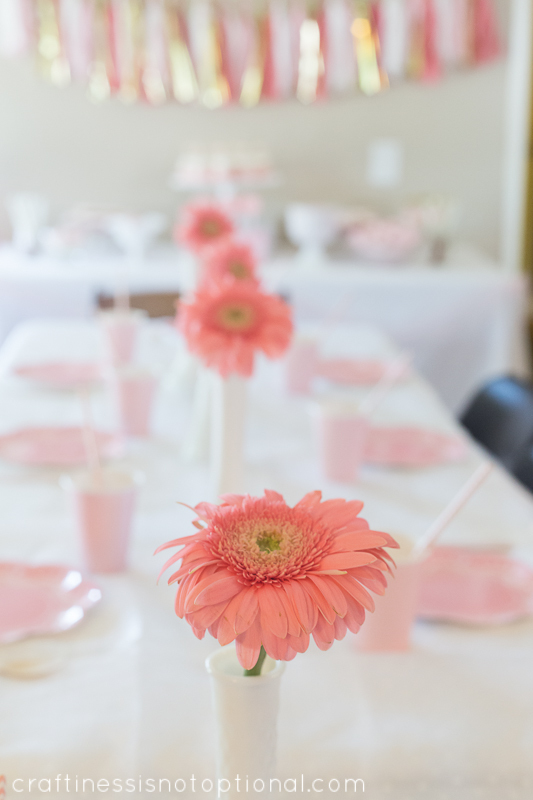 I had a table all set up for the girls to eat their lunch at, bought some cute pink daisies and stuck them in my milk glass vases down the center of the table. 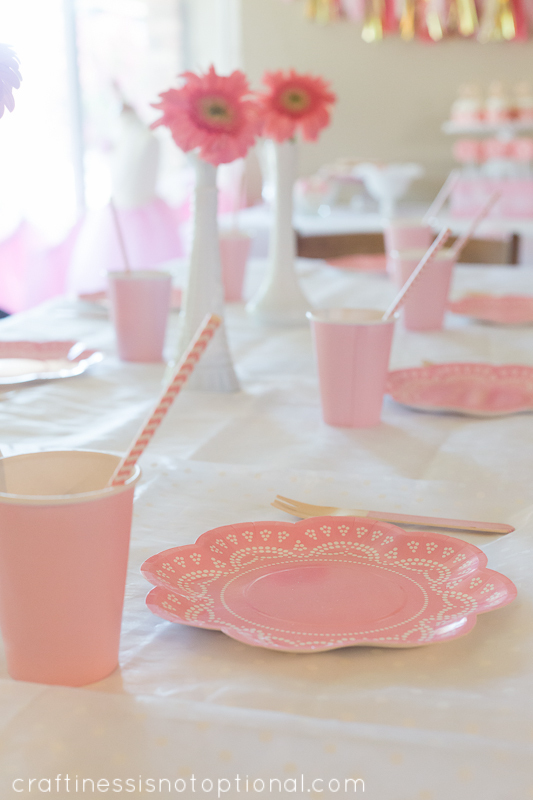 I had just enough of these fantastic pink plates leftover from the bridal shower so I used them at this party, too! They were per-fect. I also grabbed some pink chevron straws and covered some wooden forks with pink striped washi tape. My sis also helped a ton with stringing up tons of streamers and paper lanterns. I owe ya one, Julia! I gathered all the pinkish decor around the house that involved Sadie and displayed that as well! The dessert table was so fun! I really drove home the pink and white theme here. lol a little tulle swagged around the front and sides was barely noticeable in pics but cute in real life. I made some cherry chip cupcakes (from a box…for shame! haha jk nothing against box mixes…they were pretty darn good) and frosted them with this amazing buttercream recipe that I’m lovin. Topped them off with some vintage-esque plastic ballerinas! Sadie absolutely LOVED carefully placing these on top. Cupcake liners: I can’t remember where I got them, but Etsy has a ton of listings. Search for cupcake/candy/nut cups. 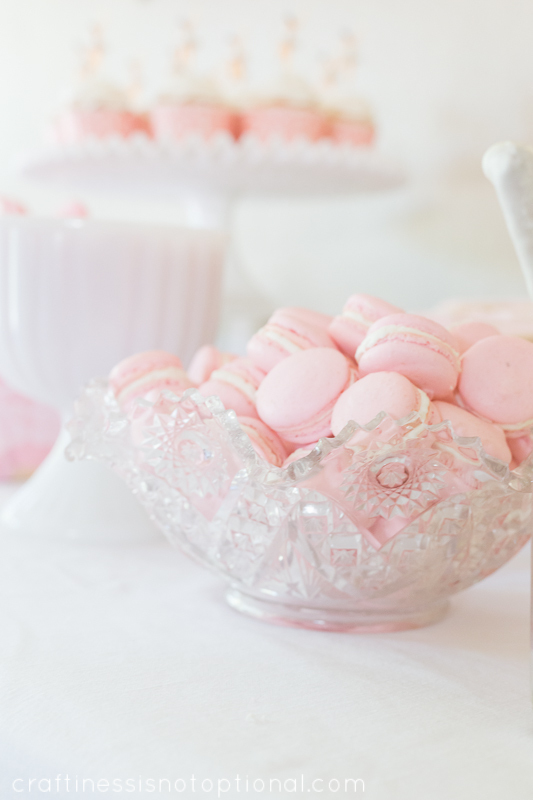 Milk glass cake plate from my amazing grandma…who noticed a few years back how I pined after her amazing vintage cake plate and gave it to me. Love ya Grandma! All the rest of the cake plates/bowls were either made by me, or thrifted. 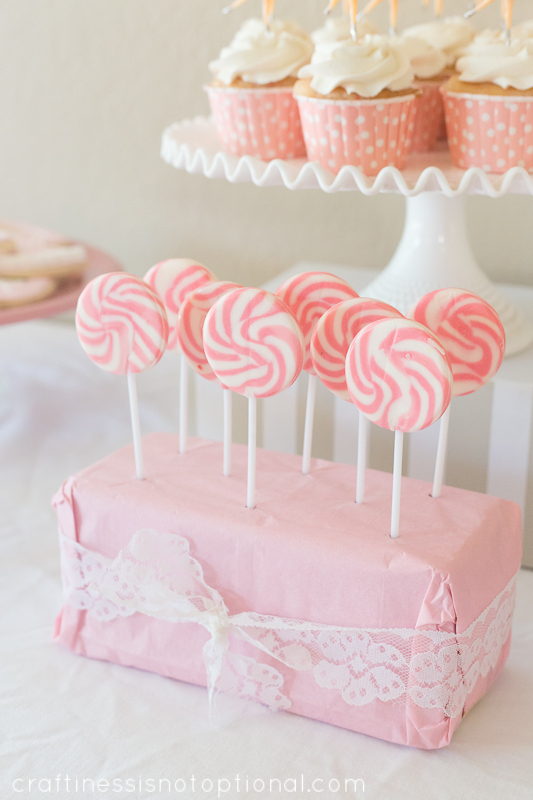 Ordered some pink lollipops (affiliate link), wrapped some floral foam in tissue paper and some lace, and stuck them in! easy. I also set the large cake plate on a box for some height. 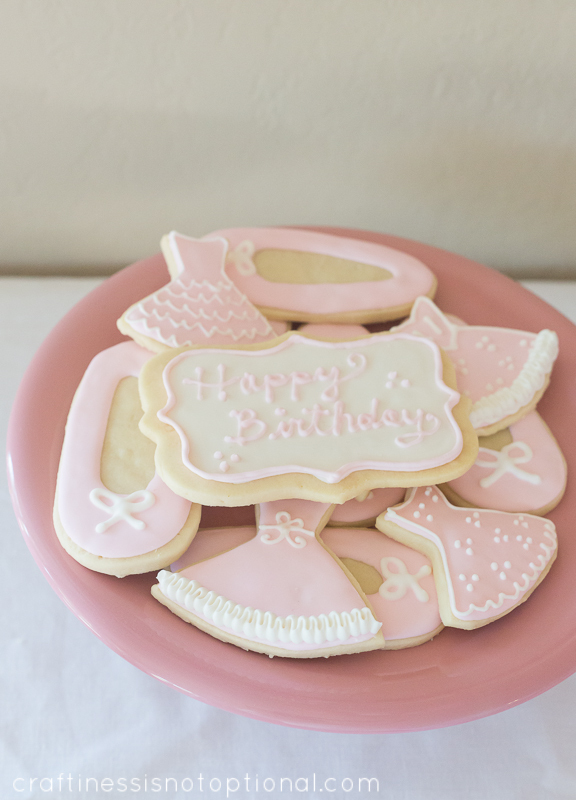 I made some ballet slipper and tutu cookies-and frosted them with pale pink and white frosting. For the big one I used this cutter. 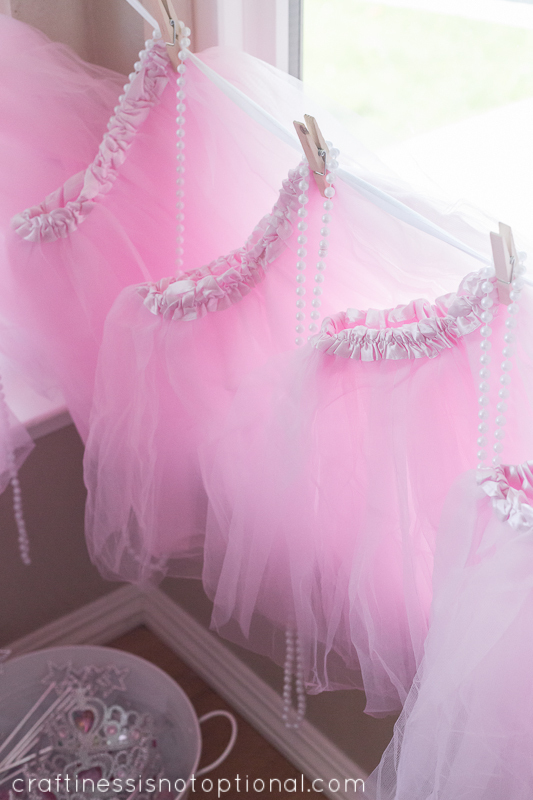 I think I used a candy corn cookie cutter squeezed together on one end for the baller slipper, and a princess dress cookie cutter (similar…affiliate link) for the tutus (with most of the skirt cut off). I love the way the ruffled edge on that one on the bottom of the cake plate worked out! The girls had fun directing me when I decorated these. ” I want to eat dat.” -Charlotte. 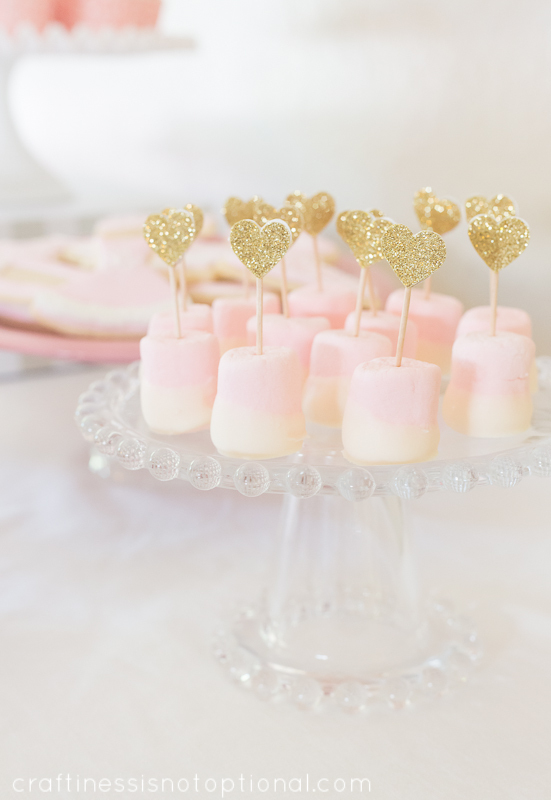 I bought some strawberry marshmallows and stuck in some gold heart toothpicks I had made for my sister’s shower but didn’t use, then dipped them in white almond bark. Yum! and so pretty. With the leftover bark I dipped some large pretzels and then sprinkled some sparkly white sprinkles on top. Yum again! I saved the rest of the meringues from my sister’s shower and put those out, too. Sadie loves them! 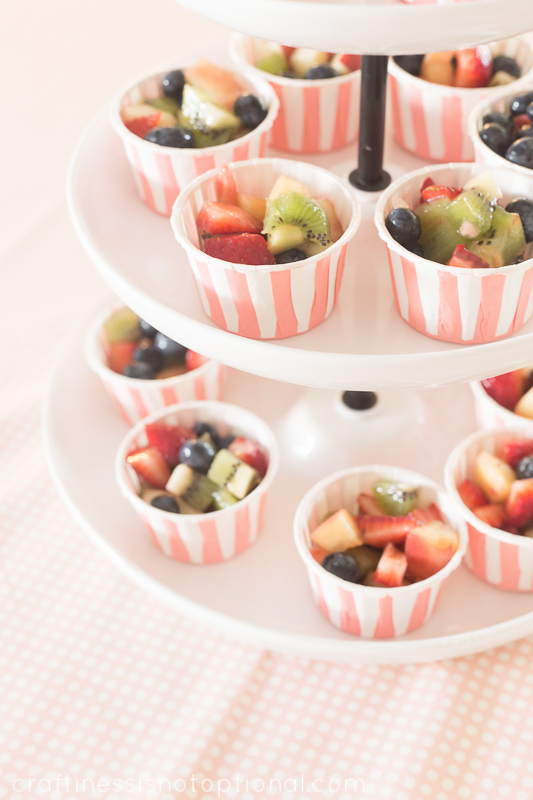 For lunch I made some yummy fruit salad and served it in these adorable cups! I also made some tiny heart sandwiches with peanut butter, and strawberry cream cheese…which I didn’t get a pic of. 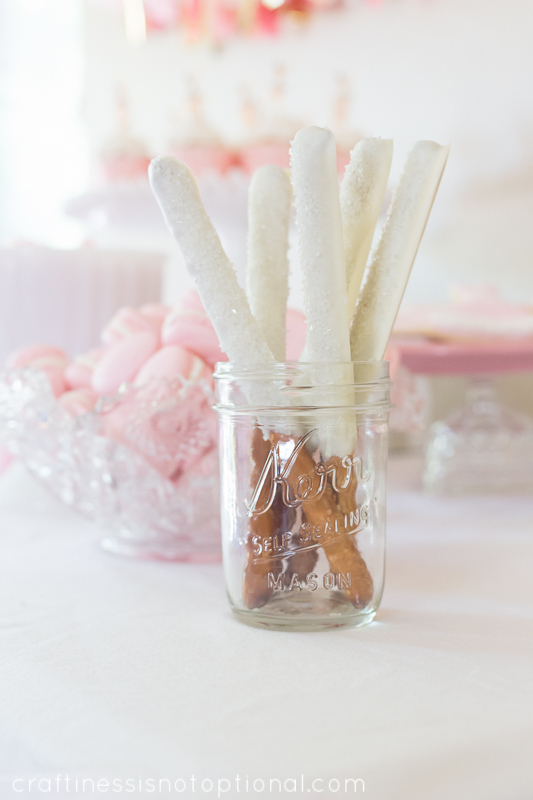 Add some string cheese and pink party punch…and that’s what they ate for lunch! 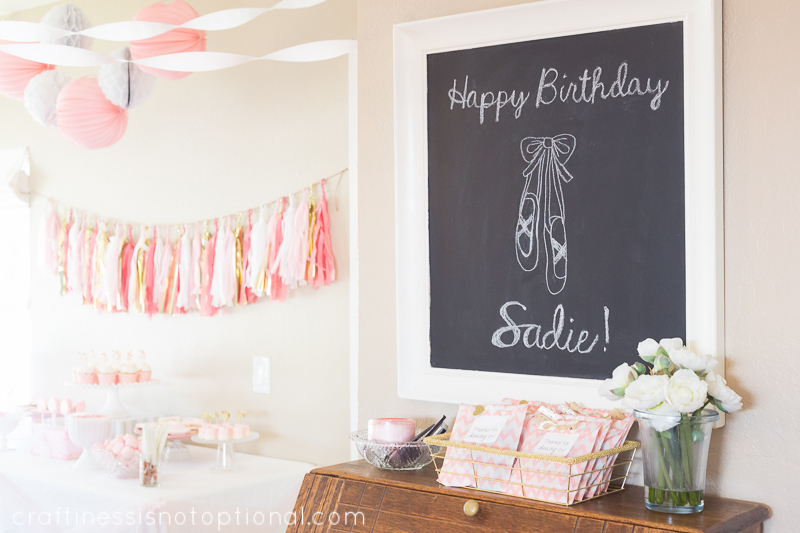 I used the same chalkboard method and designed this in Illustrator for the party-I love it! Probably one of my favorite parts of the party. I printed off some ballerina coloring pages for the kids to color and these shoes were one of the pages so I just used the same image for the chalkboard. 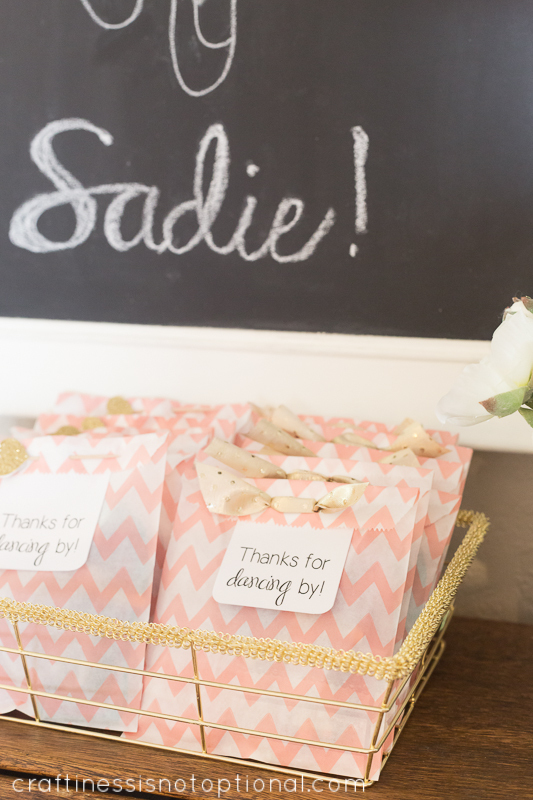 For the favors (along with all the dress up goodies! ), I packaged them up in these adorable chevron bags, made some “thanks for dancing by” tags, and finished them off with some sparkly ribbon and glitter heart toothpicks when I ran out of ribbon. Make it work, right?! I filled the bags with a lollipop, bendy ballerina toy, ballet shoe notebook, and glittery lip gloss. So girly! add a blurry shot from Instagram and this post is complete. Hope you liked it in all it’s pink and white frothy glory! ohh! so fun! 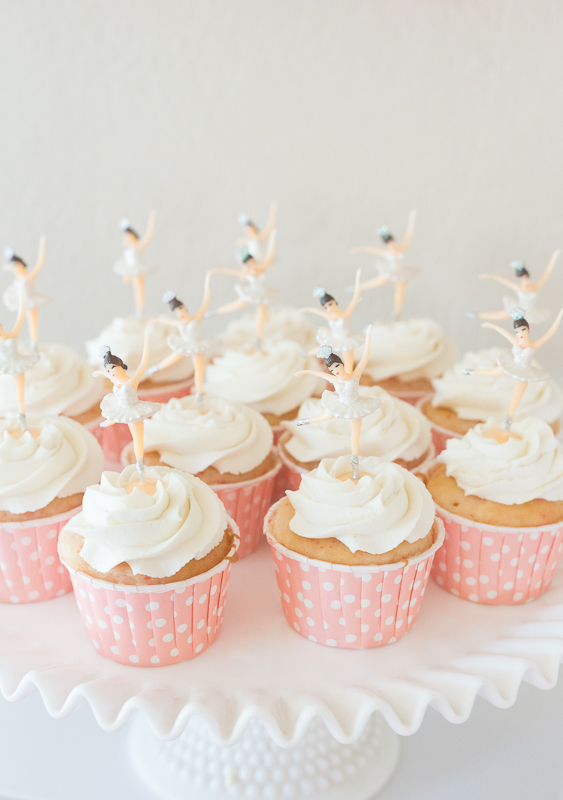 where did you get the ballerina cupcake toppers? 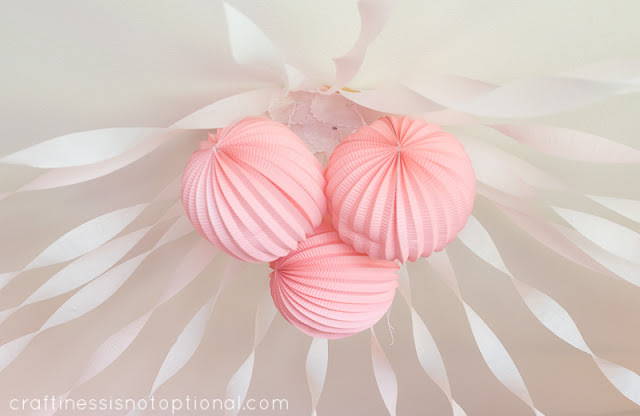 and the big pink paper lanterns? I would say Saddie is lucky to have a mama like you ! You are amazing! I’m more a hand drawn donkey on butcher’s paper taped to the back of the door kind of party host but I’m in awe of what you’ve done (along with all the grown up stuff too). Just amazing, I am in awe of your party bashes! The birthday girl looked so happy. I LOVE your parties – they look so beautiful. It looks so perfect! 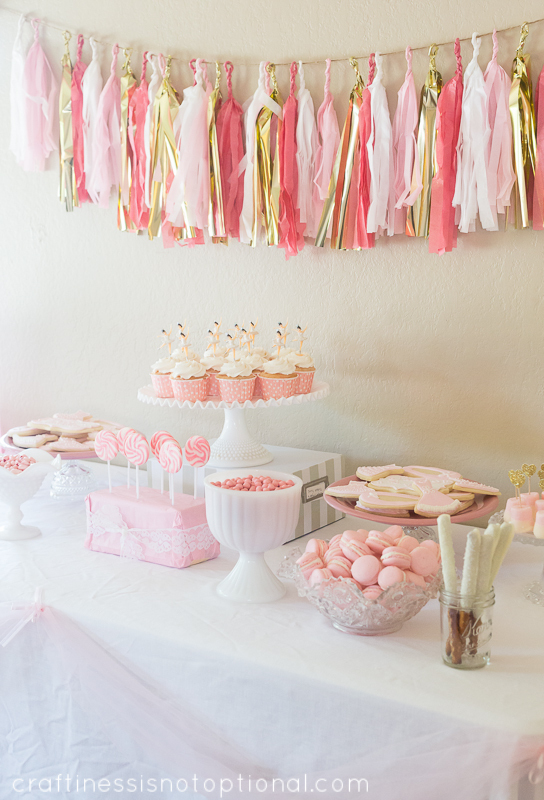 What a sweet girly party! The girls are lucky to have such a great mum! This is amazing! Another party well done. Thanks for sharing. I CANNOT believe your parties Jess!!! 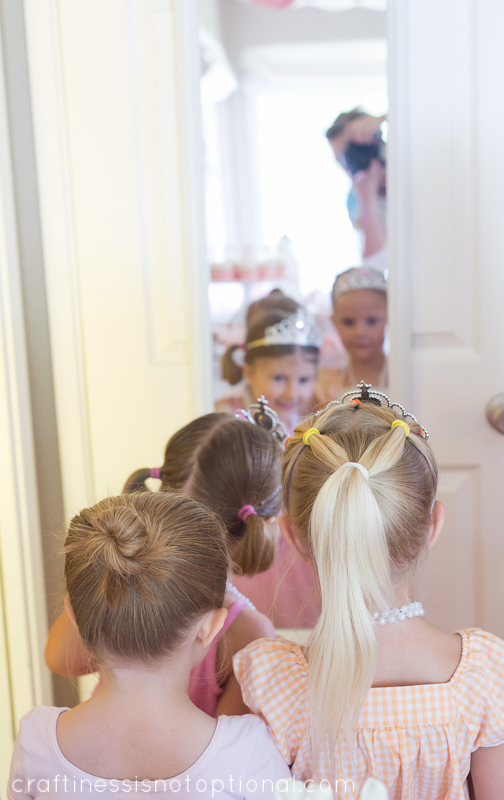 your daughters will have such amazing memories of these special days. amazing!! Oh Jess this party is beautiful. Everything looks like it’s covered with swiss merengue buttercream. This is so inspiring. Amazing…AGAIN! your cookies always blow me away. I would not have the patience! Beautiful party! You are wonder woman for getting all that done in a week and a half! What a BEAUTIFUL PARTY !!!!! Great job Mom and Sadie looks so BEAUTIFUL in her outfit. I am sure she will never forget her day Mom made just for her. P.s. 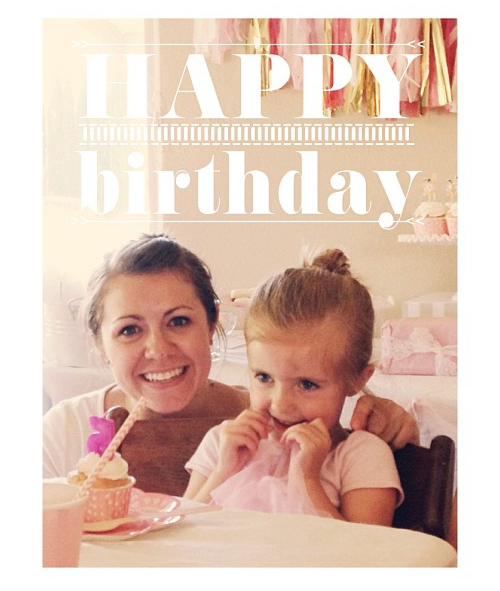 your girls are by far the cutest and so darling I have ever seen …. You inspire me so very much to do things for my grand daughters.. Thanks for all you do & share!!!! Linda Lee oh HAPPY BIRTHDAY SADIE!!!!!!! Adorable! This is the perfect little girl party! I love reading about your 2 eldest girls as they are the same age as mine! We just had a round of 5th birthday parties and are moving into the drop off phase too which definitely makes the crowd smaller. 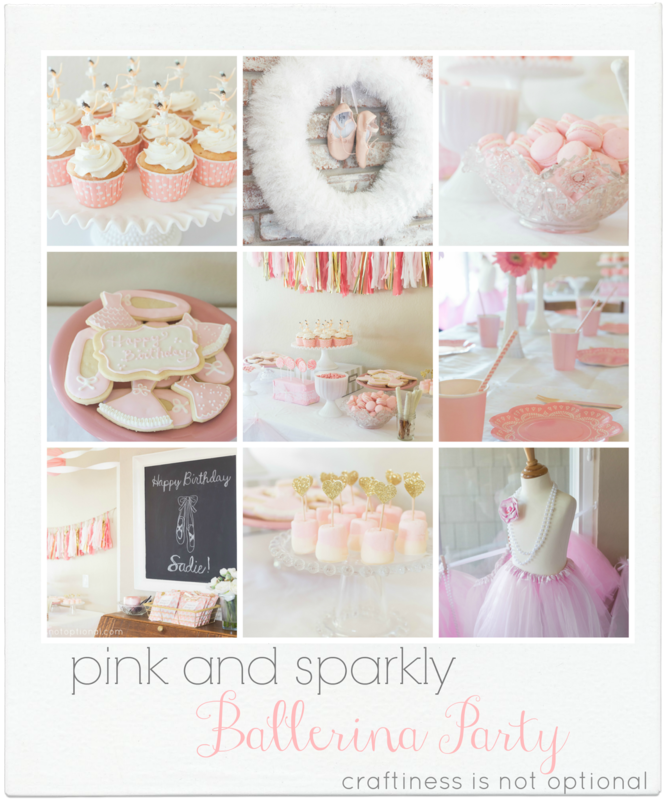 My 5 year old does ballet so great idea for a next party! Such pretty things you decorated with. Lovely soft pink colors all around. Sadie is a lucky little girl. My grand-daughter’s name is also Saidey, but spelled differently. AMAZING, Jess!! 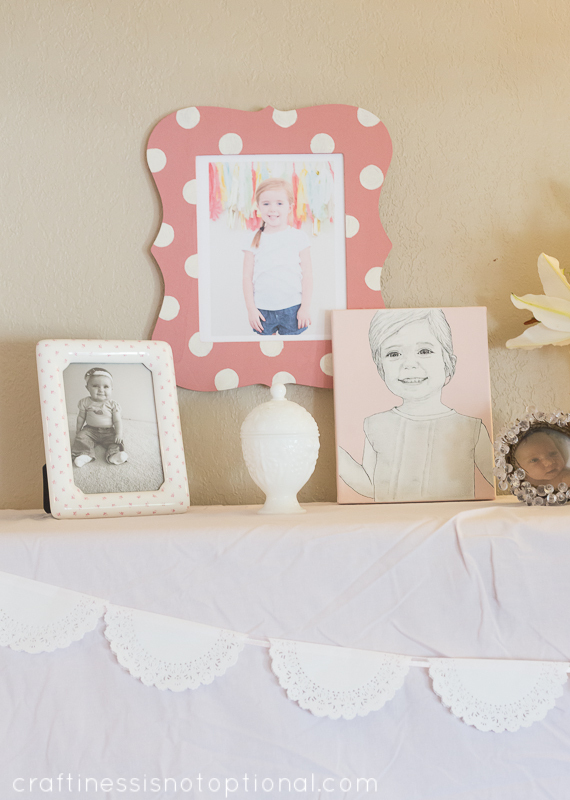 Seriously…..the party is gorgeous and your photography is blowing my mind. Beautiful work! 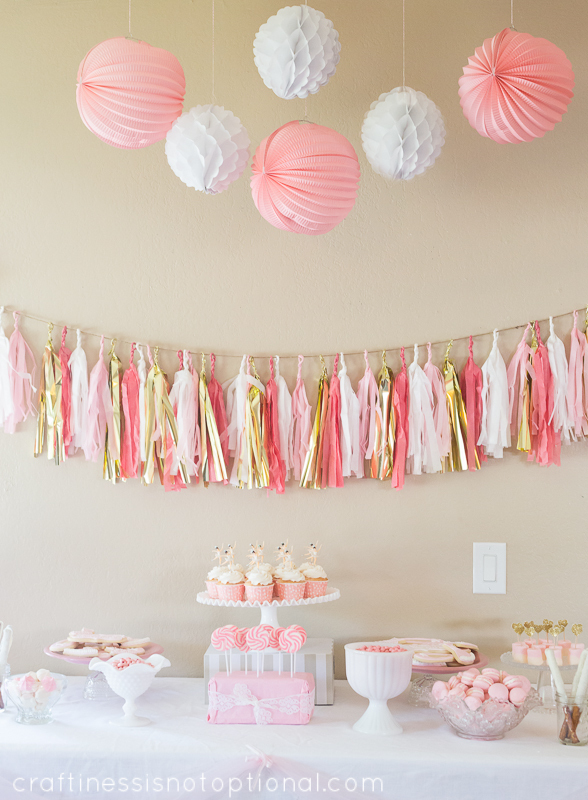 I LOVE all of the details from this party! I teach dance here in KY and I will have to use some of those ideas for girls! Amazing! Puts my daughter’s no prep party at McDonald’s to shame! You’ve definitely got talent, Jess! Ok i LOVE this! I SO wish you could come help me with my parties! Not that I throw a TON (Especially lately) But when I do, it would be nice to have a professionals help so that I could have ALL this CUTENESSS to brag about! Lol SO SO lovely!! Great job, yet AGAIN! Love ya! Just GORGEOUS!!!!! You did amazing and she’ll treasure these memories and pictures forever! Wow, I seriously LOVE this party. That silhouette on the invitations is so clever! Amazingness overload!!! 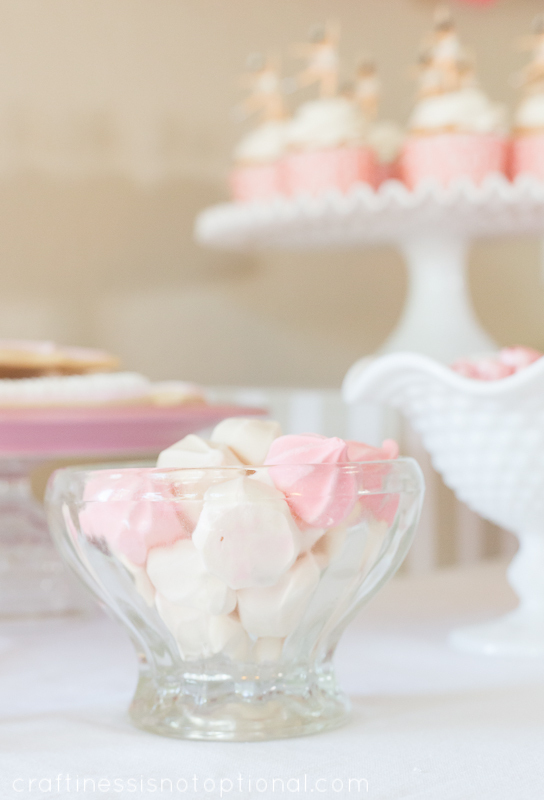 This is fantastic and the pictures have me drooling (or maybe it’s the dessert table…) Beautiful! Hope you’re taking some down time now!! Hola! No lo puedo creer!!! El 18 fue el cumple de Cloe y me inspiró mucho el cumple de vaquerita que hiciste el año anterior y ahora a un par de haber finalizado Cloe me pide que su próximo cumple sea de bailarinas!!!! ME SALVARAS!!! Todo tan bonito…….. mil gracias y saludos! You pulled it off! It’s adorable. I hope I can pull something off for my birthday girl soon. yikes. Oh my goodness. 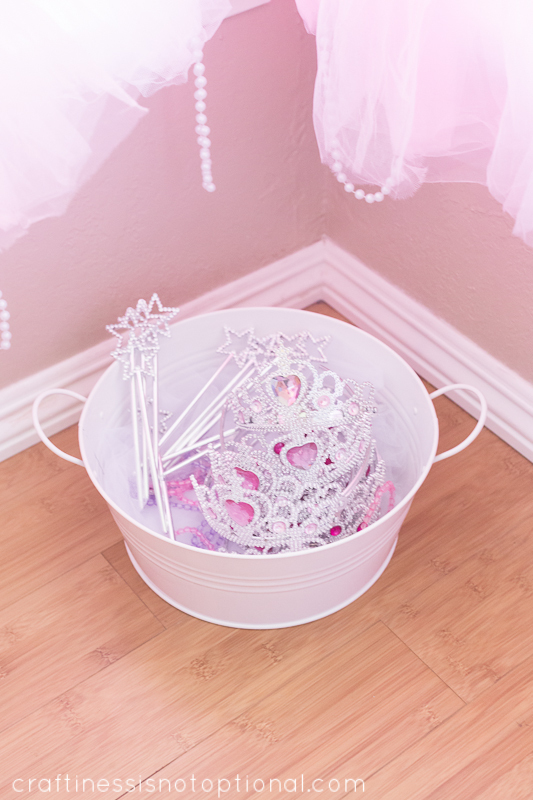 Every little girl’s dream. good mom! Hi, I’m obsessed, Obsessesd! 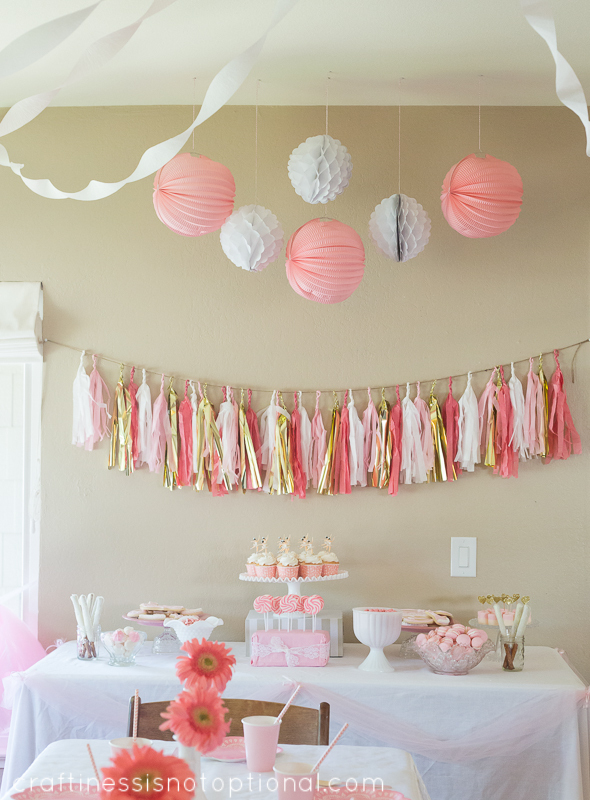 What is the gold in the tissue garland hanging up in the back? It doesn’t look like tissue paper and I will attempt to have your super powers for my little ones birthday party! thanks! OMG so pretty!!!!! 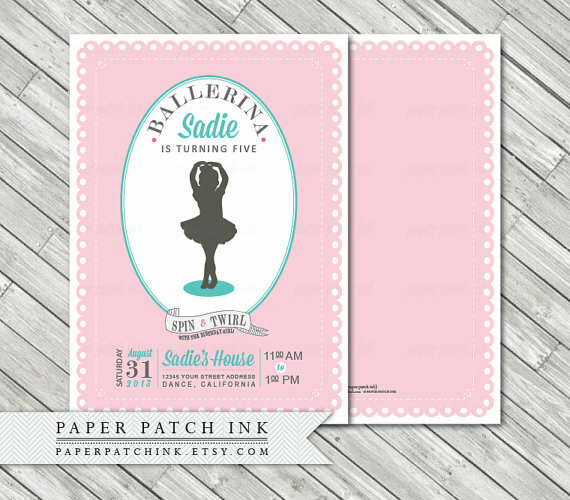 Where’d you find the ballet shoe notepads?